In November and December of 2015, we had the pleasure of inviting six distinct filmmakers to present their rough cuts to one another and acclaimed documentarians, facilitator Kelly Anderson, and guest filmmaker Matt O'Neill. This cohort sharpened a sense of suspense, restructured stories, shed new light on central personalities, and challenged the conventions of observation in documentary. In a sense, each film stitched broad horizons for us: multiple places where people find work and commerce, a connection with many pasts and traversal spaces. We can't wait to see what they do next! 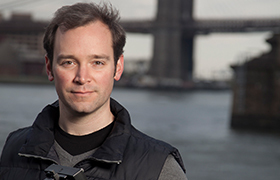 Brian Redondo is a multi-disciplinary creative with a passion for storytelling in its many forms. 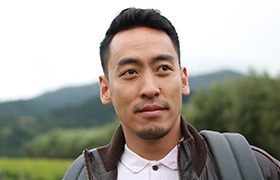 His film work includes short documentary Why We Rise about the struggles of undocumented youth in NYC, winner of Best Social Issue Documentary at CAAMFest. Brian is currently working on his second short documentary, Hurrikane , as well as his first fictional short, Bounds. 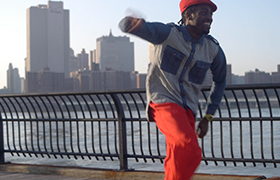 In Brian’s short film Hurrikane , a young street dancer is propelled from subway performances to primetime television. Protagonist Alain "Hurrikane" Lauture hones his craft in street dance battles and subway cars, until his hard work pays off and he wins the biggest street dance competition in the world. Opportunities start pouring in, and he lands a spot on So You Think You Can Dance . Alain must then deal with his ascent to fame while maintaining his shining attitude that makes his dancing irresistibly magnetic. David Kagan is a multimedia artist who uses pop cultural formats to explore issues of identity and iconography. He has received several grants to travel for his work, been involved in many group exhibitions, and has had films screened all over the world from Morocco to Ecuador. David is currently working on his short documentary Obruni Papa about his collaborative music-making experience in Africa. 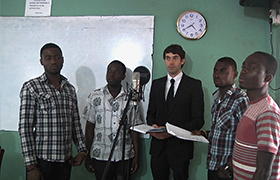 Through a grant from the Art Matters Foundation, David traveled to West Africa to film the project, Obruni Papa . During his travels, David recorded an “African-style” pop album with some students at the University of Ghana and performed as a band at the first International Reggae Festival at Legon. His film explores the frictions that arise in the intersection of a conceptual performance practice with the traditional endeavor of Ghanaian music making, and touches upon the problematic sociopolitical relationships between the West and developing economies. 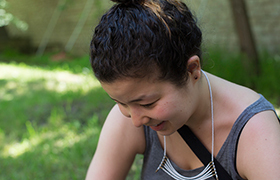 Jessica Kingdon is a producer/director with a dynamic background in narrative, documentary, and experimental work. She has worked on three narrative features as producer and associate producer, and has produced and directed several shorts. Her short films have been screened in NYC and internationally, and she has recently completed a five-week documentary intensive at Union Docs in NYC. Jessica is currently working on her short documentary film Yiwu . 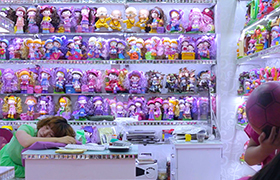 Yiwu is an observational ethnographic documentary which explores daily life in the Yiwu Markets in China, the largest plastic market in the world. The film does not have a traditional storyline, but instead serves as an index of inventory in this major center of commerce, giving a broad topological look at the markets. By putting distance between the individuals in the market and the viewer, the goal of the film is to give the audience a broader and perhaps more universal truth of states of existence. Jessica explores the contradiction of the permanent space that exists to cater to consumer desires of transitory visitors. 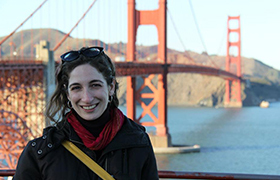 Lauren Mucciolo is an award-winning, independent producer based in Brooklyn, NY. 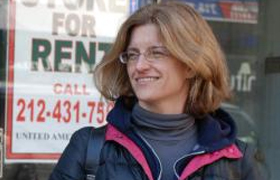 Since 2011, she has worked largely with PBS Frontline, specializing in character-driven documentaries. Poor Kids (2012) was nominated for a national Emmy Award; this film and Solitary Nation (2014) both won the RFK Journalism Award. Her most recent film Being Mortal (2015) was nominated for a Sentinel Award. Lauren is currently working on a personal documentary called The Beaches . 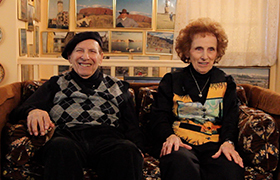 Lauren’s short, personal documentary The Beaches centers on her grandparents, Mary and Lou, an Italian-American couple in their late 80’s living in Howard Beach, NY. The couple have devoted the past 30 years to traveling to over 200 World Heritage Sites, documenting their travels along the way. In the film, The Beaches features stories from their immigrant childhoods, raising a family, and spending retirement as world travelers. Lauren discovers her and her grandparents are both on journeys to discover and preserve heritage, whether it be collecting photographs of ancient ruins, or more intimately, filming loved ones who are the last direct link to a cultural identity which is eroding with each passing generation. 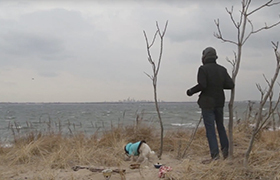 The Beaches asks the questions: Does documentation safeguard memory, or does it merely create an imitation of remembrance? And how can a life once driven by curiosity and verve face its own mortality? Shayok Mukhopadhyay grew up in Calcutta, and studied Documentary Photography & Photojournalism at the International Center of Photography, New York. 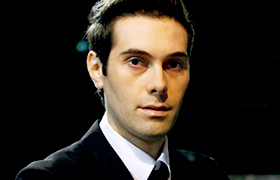 He has made short films for Euronews and RAI Television, and his short documentary, Charok , was screened at both the Portland Film Festival and Bali International Film Festival in 2015. Shayok is currently working on his film Counting the Waves . Counting the Waves is a film about a wooden boat fishing in the Bay of Bengal. It is about the future of fishermen, about the oil lamps they float on the sea to mark their nets, about making tea, and about a fish that takes longer to die than to eat. The moon is full, the night is long, the catch is big, yet the men are poor. Tim Ballard is a multi-media storyteller, specializing in animation, filmmaking, and illustration. His natural inclinations often lead him into explorations of the imagination and investigations of the relationship between the human and the non-human worlds. Tim has worked on a wide spectrum of projects, from animating sequences in documentaries to directing a music video featured on NPR. 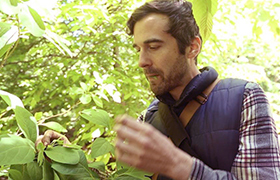 Tim’s short film Forage chronicles his journey living in Manhattan, including a 3-day experiment living in a park eating only what he could forage from the forest or the streets. Using the act of foraging as a vehicle to connect with a land all but lost beneath the city, the simple search for food opens into a deeper uncovering of two worlds separated by time, and the echoes of a people that knew the land best. In exploring how a culture's way with food speaks to its most fundamental relationship with the land, what can be seen as the boundary between worlds grows thinner throughout the journey?